This is an arching, multi-stemmed shrub in the honeysuckle family. The burgundy stems carry glossy green leaves and fragrant clusters of small, white bell-shaped flowers that attract bees. 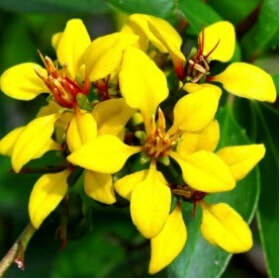 It has no known pests, and typically holds on to most of its leaves in our climate. 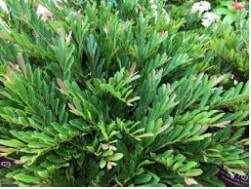 This is new to local retail nurseries, and is promoted as an alternative to boxwood. 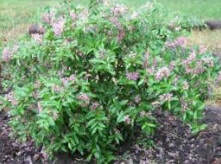 Cinnamon Girl is a low-growing, spreading variety with small leaves that start out plum-purple and turn blue-green. One review described it as an ultimate parking lot shrub because it’s so tough and carefree. It has insignificant red flowers. 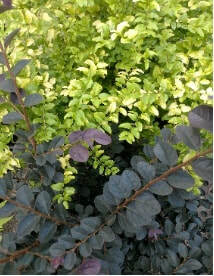 A familiar landscape plant, it comes in a wide variety of sizes and colors ranging from deep plum to greenish plum. Our deep plum plants will be in front of the tall wall of the new building facing the parking lot. The idea for putting color and height against the wall rather than turf—as originally planned—came from one of our GSM architects, Sam. Loropetalum is almost always hedged to perfection, but Sam is quite passionate about allowing it to grow free-form to showcase its graceful arching branches and frilly pink flowers.